Please, please fix your app!! I have always loved the magazine but now the app crashes every few pages and I’m losing my mind. I’ve been trying to read an issue for 15 minutes now, and the app has crashed 4-5 times. I noticed many other comments about issues with the app, so it appears that Backpacker just doesn’t care. I love this magazine and prefer it to be digital Please fix it been missing out on 3month of magazines now It doesn’t work on my iPad which is where I read it. I have the subscription through iTunes. 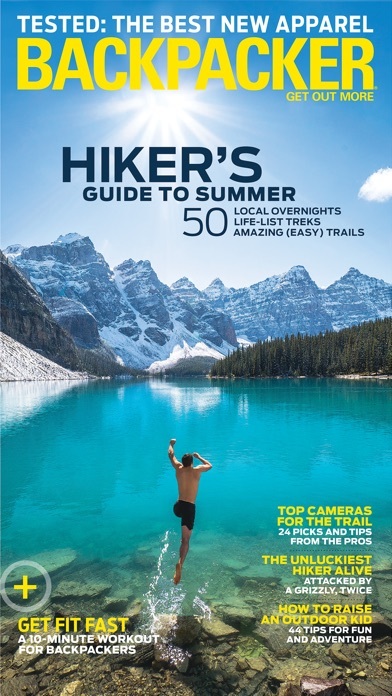 Backpacker magazine is phenomenal! Stunning photos, great info, the works. The app, however, has been a heap of steaming garbage for ages and it seems to just get worse. I subscribe digitally, even though it’s a bit more expensive. I do this to try and cut down on waste and make the content easier to access (even while on the trail). The app is not optimized for current phones (and hasn’t been for sometime) it’s also buggy as all heck. Backpacker, please, oh please, update your app to be worthy of the content you put into it! If it doesn’t get updated soon, I’ll have to unsubscribe. I have a brand new iPad Pro and this app cannot even stay open long enough for me to read an article. Active subscription. Have not been able to see any magazines for 4 months. Yes I follow the instructions. Had a few issues a month ago but subscription services was able to fix it for me. I like being able to read issues on my phone whenever I get a free moment. Best magazine ever! BUT worst app ever!!! The app never works properly and it is extremely frustrating because I don’t always receive my magazine in the mail either, so having both a digital and paper subscription hasn’t proven to be that effective or worth it. Ugh!!!! PLEASE FIX THE APP!!!!! !